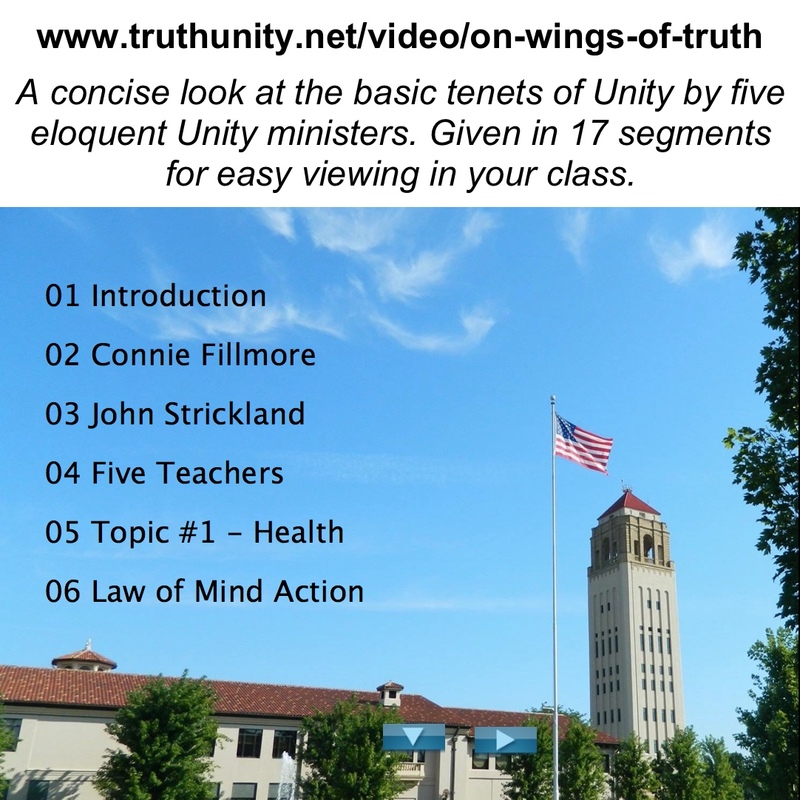 On Wings of Truth celebrates 100 years of Truth with a concise look at the basic tenets of Unity philosophy. Prosperity, healing, and human relationships, all created through the law of mind action, are the topics discussed by some of the most eloquent Unity ministers. The Fillmore tradition is represented by Charles R. Fillmore, chairman of the board and Connie Fillmore, president of Unity School. Along with John A.V. Strickland, director of Silent Unity, they remind us of the spiritual significance and history of the Unity work. 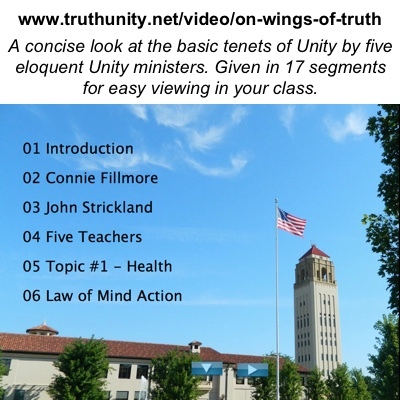 This inspirational program incorporates Unity philosophy, history, and practical self-development instructions into a precious keepsake for the Unity follower or an introduction for those just becoming interested in Unity philosophy. Eric Butterworth Eric was ordained as a Unity minister in 1949 and is currently serving as minister at Unity Center of Practical Christianity in New York City. Eric is responsible for numerous books, articles, and cassette tapes including his most recent album, The Gospel Truth. Dorthy Pierson Dorthy is the co-minister of Christ Unity Church, Sacramento, California. Her writing talents have been featured many times in Daily Word. Jim Rosemergy Jim is a Unity minister who serves the Unity Church on the Plaza in Kansas City, Missouri. A noted Unity author, Jim's cassettes include Famous Bible Stories From the Old Testament: A Metaphysical View. Sharon Poindexter Sharon is a Unity minister active in the Kansas City area. She is an excellent teacher, lecturer, and counselor. Length: One hour. 01 - On Wings of Truth On Wings of Truth celebrates 100 years of Truth with a concise look at the basic tenets of Unity philosophy. Introduction by Charles R. Fillmore. 02 - Connie Fillmore describes Myrtle's healing Myrtle hears “You are a child of God, and therefore do not inherit sickness” and she and Charles begin the healing movement known as Unity. 03 - John Strickland talks about the power of united prayer at Silent Unity “I quiet my thoughts and enter into a time of prayer.” From a faithful band of people meeting in the Fillmore home to over 250 people, Silent Unity prays with you 24x7. 05 - Topic #1: Health “In Truth, you really are a whole person” says Dorothy Pierson. The nature of God as being wholeness, completeness, pure light is also our nature as we are of the same nature. 06 - The Law of Mind Action “The world we are living is an out-picturing of what we have created in our mind,” says Sharon Poindexter. By changing our consciousness, we change our life. 09 - Giving Thanks “The words of praise and thanksgiving give life to whatever has lost its life” says Sharon Poindexter. 11 - Right Livelihood “If you will do what is yours to do and to be what is yours to be and give yourself to what is yours, life will provide you the means to do it” - James Dillet Freeman. 12 - Giving and Receiving “If we’re not giving and not receiving, we’re like the Dead Sea in that there is no outlet there and we are lifeless” says James Rosemergy. The must be a constant flow of life. You can use these video clips in your classes to introduce a particular topic. They are great discussion starters. Also, I was asked to cut some DVDs (November 2016) to play in a DVD player. They are very low quality (early 1990s VHS). I've got about ten left. Email me with your mailing address if you would like one. And, if you know what you're doing, I've got an .ISO file to let you cut one of your own.